This week, Apple expanded the lineup of band options for Apple Watch owners, including the ability to buy the Nike Sport Band on its own. 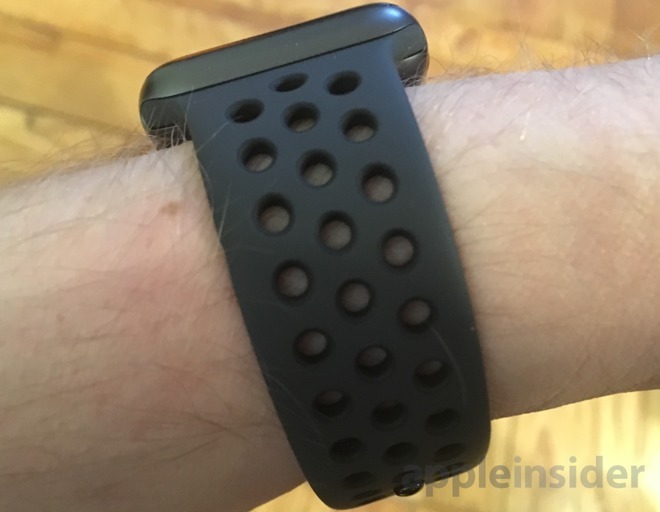 AppleInsider offers fitness-focused Apple Watch users a first look at the add-on accessory. 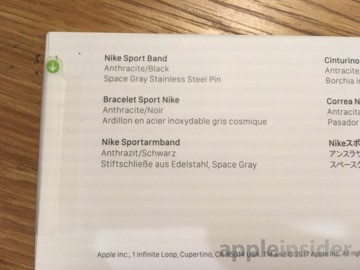 Announced by Apple on Tuesday, the new Nike Sport Band comes in "Anthracite/Black," "Pure Platinum/White," and "Black/Volt." 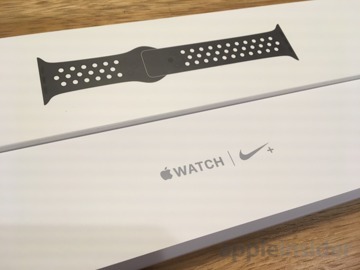 Previously, the perforated bands were only available to users who bought a second-generation Nike-branded Apple Watch. The Apple Watch Nike+ launched last year, a few months after Apple Watch Series 2 and Series 1 units became available. That means anyone who bought at launch— or who has stuck with a first-generation Apple Watch— could not buy the official Nike bands until this week. 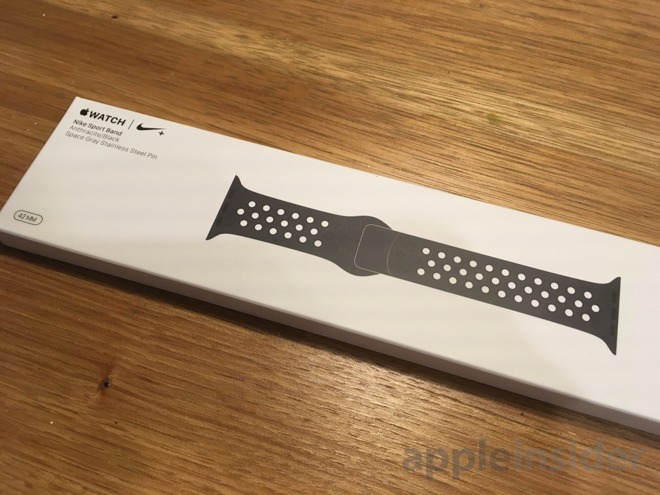 The Nike Sport Band arrives in the same-style box as other Apple Watch bands, though the new partnered accessory includes Nike Plus branding on the box. 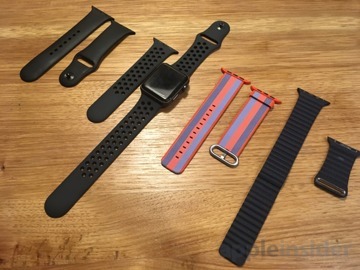 It comes with both small/medium and medium/large sized strap lengths for users with different wrists sizes. 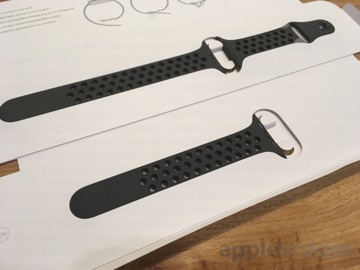 The lightweight band has a somewhat funky look with a practical purpose: A series of identically sized holes up and down the length of the band reduce its weight significantly. With less material, the Nike Sport Band is also far more flexible than the legacy sport band, which comes in the box with most new Apple Watch purchases. As a result, the Nike Sport Band offers a number of options for athletes. Not only is it lighter and easier to put on, but the perforated design also allows spaces for skin to breathe and sweat to escape during a workout. The separate Nike Sport Band is priced at $49 and is available to purchase now direct from Apple. It debuted alongside a series of new spring colors and styles for the Apple Watch, including six new shades of woven nylon for $49 apiece, seven new classic leather straps for $149 each, and two new additions to the Hermès Leather collection for $489.